← Foreign Corruption — More Aggressive U.S. Prosecutions? Yes, They are Needed. Global Economic Sanctions — Many of Them by Many Players — But How Effective? In the last 13 years since 9/11 sanctions for domestic political and foreign policy reasons have exploded worldwide. They include financial sanctions, trade and investment restrictions, sanctions on travel, arms embargos, commodity restrictions, financial controls and disclosures, diplomatic sanctions, sanctions on aviation and shipping, among others. These sanctions have been imposed by the U.S., the EU, the U.N. and others. The real impact and effectiveness of sanctions are open to serious question. Sanctions are often imposed as a default response when no other action is realistically available. All to often they are authorized to appease domestic political pressures. They may or may not have realistic chances of success. They are feel-good measures. Rarely do sanctions alter the targeted countries policies. They impose undue burdens on their domestic populations not their leaders. It’s the U.S. and international business communities that feel the sting of sanctions and retribution from counter-measures. Unexpected consequences impose new problems. My point is very simple. A sanction is an easy answer. But hard to undo. It’s hard to find much international success. …. 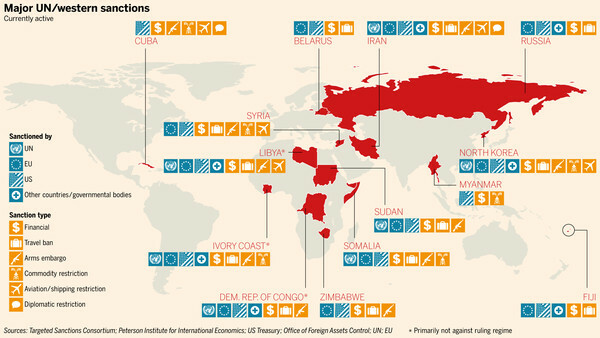 “Sanctions: War by Other Means.” Financial Times (March 31, 2014). This entry was posted in Global Trade Relations and tagged 'default' sanctions, domestic reasons for sanctions, EU sanctions, history of sanctions, impact of snactions, sanctions, sanctions and their lack of success, sanctions since 9/11, success of sanctions, U.S. sanctions. Bookmark the permalink.